In the movies, everyone loves rooting for the bad guy. So naturally everyone loves a good heist sequence. Heists can come in many shapes or forms. They can be noisy (the machine-gun run in Heat) or they can be quiet (the Rififi-riffing vault gymnastics in Mission: Impossible) but to be effective they have to be one thing: exciting. And no, Tim Burton holding me up and stealing my money for his Planet Of The Apes remake doesn’t count. Here are my top five heists. Tell us your own personal favourites in the comments section below. This bid to crack open the safe of an armoured car company is the tough guys’ heist. Clint Eastwood fires a cannon. George Kennedy scowls and tries to double cross everyone. There’s a gritty car chase. And Jeff Bridges dresses up as a woman. Beautiful film, beautifully executed heist. Who would have thought the best bit of a Batman film wouldn’t feature Batman? 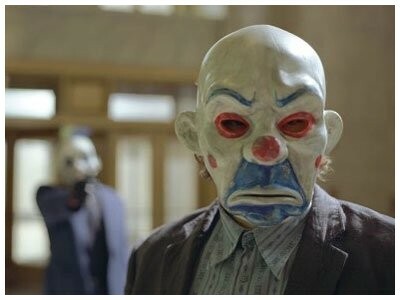 The exhilarating bank heist in The Dark Knight is the perfect introduction to a great character and a great movie. When watching this at the cinema you could feel the hair on everyone’s necks stand up. If only all comic book movies had sequences as gripping as this. Click HERE to watch it. Most heist movies settle for just one heist (Quentin Tarantino didn’t even bother going that far in Reservoir Dogs) but forgotten 70s gem The Hot Rock crams no less than four into its running time. 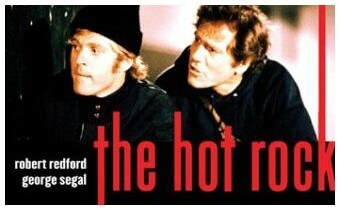 Robert Redford and his gang of bungling thieves do a number of jobs to get their hands on the titular diamond. There’s a prison break, a bank job and a police station break-in that sees the crew helicopter past the under-construction Twin Towers. For my money though, the museum heist to steal the rock is the best – George Segal manages to get stuck in a glass case and another crew member swallows the diamond in the middle of a chase unworthy of the Keystone Cops. Not the smoothest of heists, but one of the most enjoyable. Catch a glimpse of it in the trailer by clicking HERE. 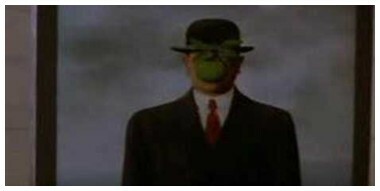 Ah… so this is where Christopher Nolan got his inspiration from. The reason this heist rates so highly is that it’s actually quite clever. 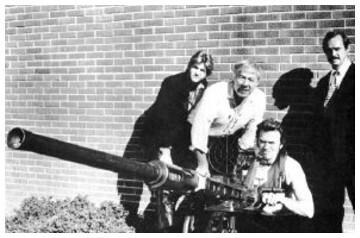 De Niro, Kilmer and uh, Sizemore may think it’s cool to rob a bank with all guns blazing, but Bill Murray prefers the more thoughtful approach. 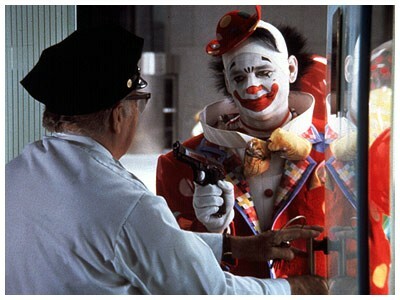 Knocking off a financial institution in clown make-up before making your getaway disguised as one of the hostages is the foundation for a pretty brilliant little scheme. Like number 2 in this list, this heist is brilliantly planned and fun to watch. However, there are a few things you’re going to need to pull it off. Firstly, you’ll have to be filthy, stinking rich. Secondly, you will need to have an eye for fine paintings and know your way around a museum (guess that rules Mr Blonde out). Thirdly, you will probably need to be sleeping with the very woman hired to catch you. And finally, you’ll have to know a lot of guys who wear bowler hats. If anyone can make this happen, James Bond can. Pierce Brosnan’s Thomas Crown manages to return and steal a painting all at the same time. It may be art for art’s sake, but it sure is lovely to look at. Watch it by clicking HERE. Let’s… play ball! WHAT ARE YOUR FAVOURITE MOVIE HEISTS? This entry was posted on February 4, 2010 at 8:40 am and is filed under TOP FIVES with tags Batman, Comic, heists, James Bond, Movies, Quentin Tarantino. You can follow any responses to this entry through the RSS 2.0 feed. You can leave a response, or trackback from your own site. Oh Lads, this should have been a top 10, so many good films. Great call on The Hot Rock, a hidden gem, made even better because of the Twin Towers. Would have included The Italian Job, the original, great script, cast, fantastic ending, couple of seminal scenes. Getting all cultural on yo’ asses there is a great French heist called Rafifi. It has subtitles and is in black and white and everything. Superb! …and for best botched heist – my choice would be Dog Day Afternoon. what about Heist? The bullion robbery from the plane is a gem. For sheer ambition what about The Anderson Tapes? A whole block of flats takes guts and nuts. The Italian Job is okay but when it comes to gangs the best is surely Kelly’s Heroes… okay so the heist itself is simply shooting a door but, on the other hand, DON RICKLES! Quick Change was my favorite film in high school. Chuffed to see it here. It perhaps wasn’t so clever, but bank heists always make me think of Point Break. Also, Clive Owen in Inside Man was rather Murray-esque with his excessive planning. Quick Change! Awesome and random. I loved that movie back in my adolescence. I haven’t seen it in years. Sometimes remakes ARE better, and The Thomas Crown Affair remake is the best example of that. That film is pure and utter enjoyment and the final revelation at the end is priceless. Totally awesome #1. I might have added Oceans Eleven or Mission Impossible, but great interesting list. When reading through this list I was thinking about Oceans Eleven so agree with Heather on that one. Another I would have in my list would be “Inside Man”. A personal fave is the the train robbery at the the start of Butch Cassidy & the Sundance Kid – great set-up and dialogue. 3 of the Die Hards were basically heist movies, weren’t they? I’m with david on this – where is Heat? Sure, most of the sequence isn’t actually the heist itself (mainly on how spectacularly things fall apart), but it’s still absolutely stunning, right down to Al Pacino sniping Tom Sizemore and Dennis Haysbert dying in a rain of gunfire. Iconic stuff right there. Yeah, I gotta agree… Heat not being on this list is a shame, boys! Don’t know if anyone remembers this but the very first teaser trailer for the first Spiderman film showed clips of an awesome bank heist. The thugs raided the bank and got away on the roof in a helicopter before ending up caught in a giant web slung between the twin towers. This was late 2001 so the scene was cut for obvious reasons. Shame because it looked like a great scene. The sequence in Heat is definitely stunning, but for me it was mainly the SOUND of it – the gunfire was up loud and scary in a way that I haven’t heard in any other movie. I stand corrected Ross McD 🙂 So where’s Lost in Translation then? Think you should have a section comparing Sophia Copola’s oscar-winner and Jane Campion’s The Piano oscar nominee…let’s hear it for the girls!